The women's restroom has four bathroom stalls with lockable doors. Every stall has a porcelain flush toilet, double toilet paper dispenser, covered trash receptacle, coat and hat hook, and an interior lock. The men's restroom has one private bathroom stall and three Sloan porcelain waterless urinals with privacy dividers. 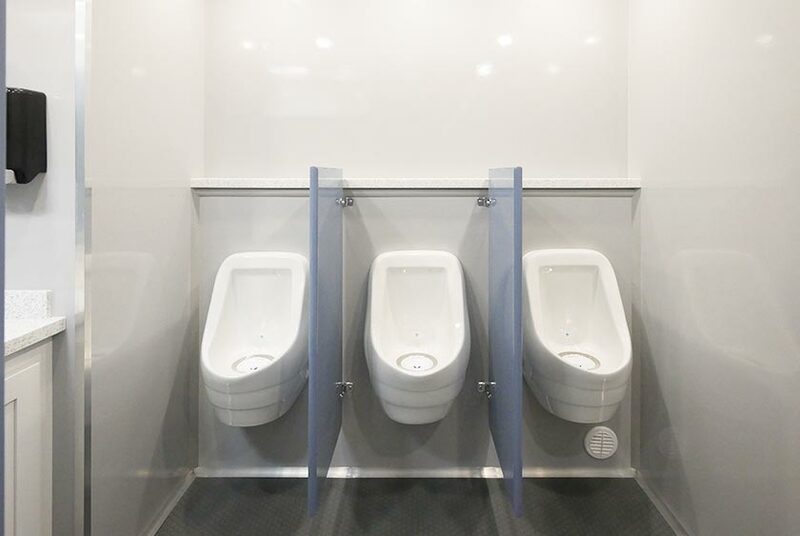 There is a marble shelf above the urinals for convenience. 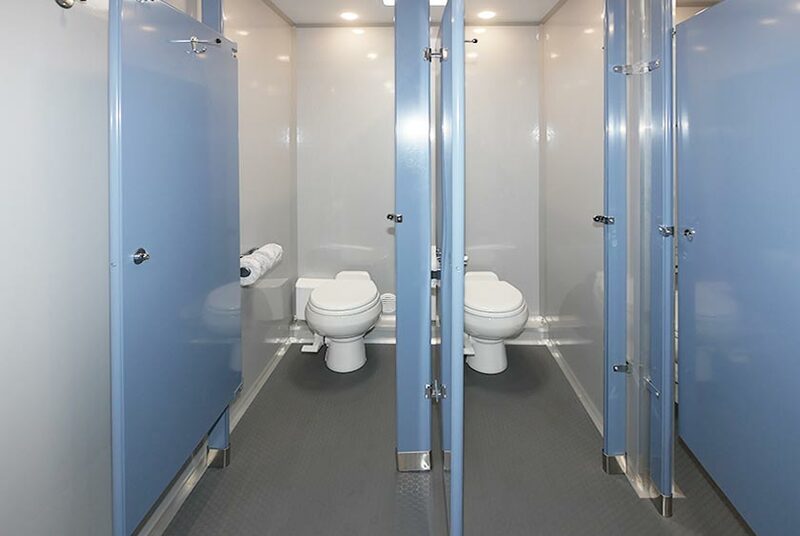 Each of the stall doors and privacy dividers is a lovely light blue color. 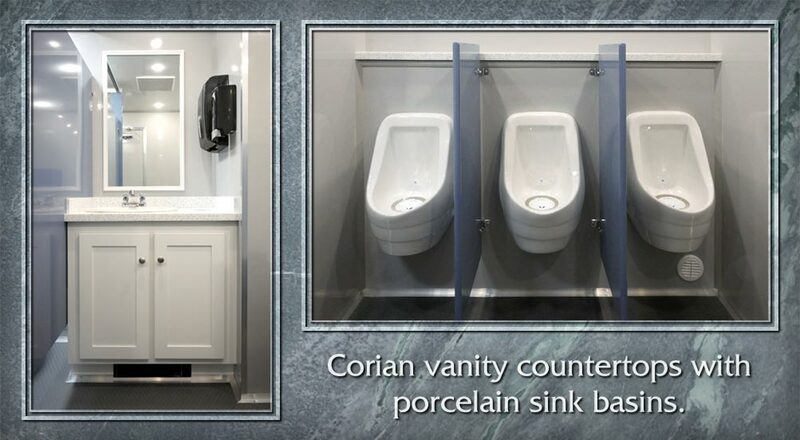 Both restrooms have Corian vanity countertops with porcelain sink basins. The women's side has two sinks, and the men's restroom has one. 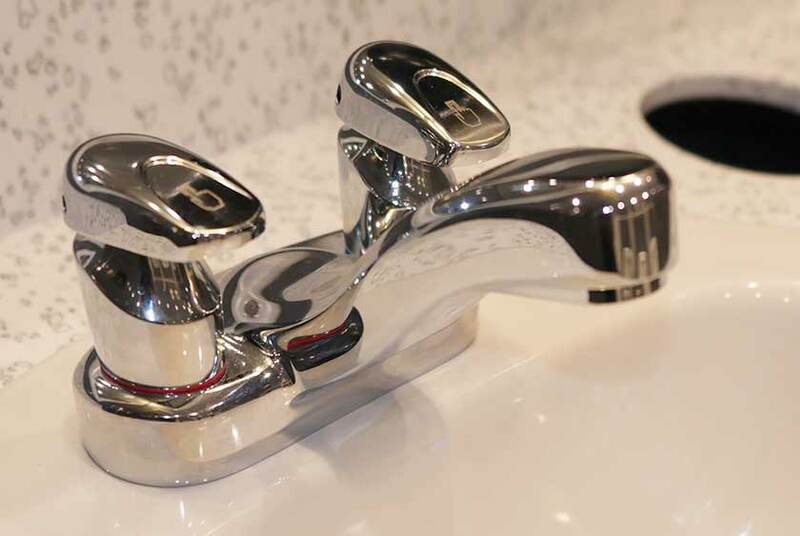 Each sink has chrome automatic faucets to supply hot and cold water. There are wall mounted soap and hand towel dispensers in the vanity area. The vanity's built-in trash receptacle will help keep the restroom clean. White painted wood trim mirrors are wall mounted above the sinks. 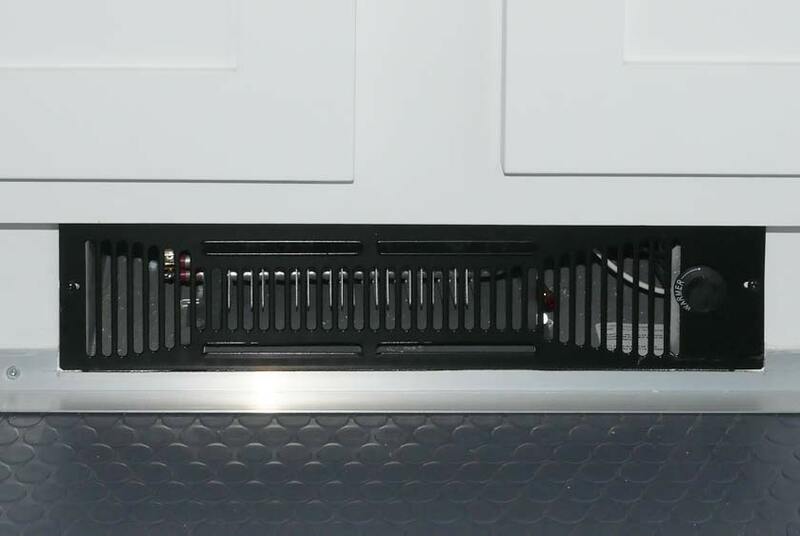 Extra supplies can be stored in the vanity's storage cabinet. Commercial grade rubberized laminate flooring is extremely durable and perfect for heavy construction jobs. 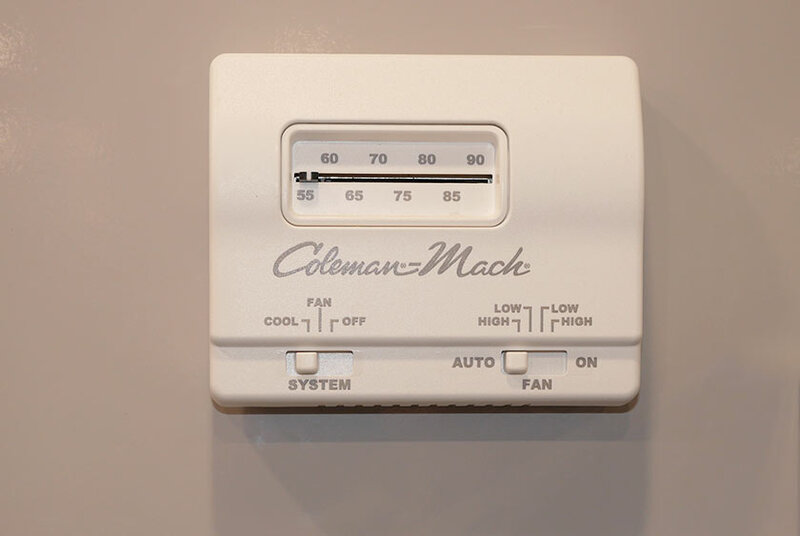 A Coleman-Mach thermostat heat and air conditioning system can be adjusted to the perfect temperature inside the SOAP STONE Restroom Trailer. Additional toe-kick heaters in both restrooms will provide extra warmth during the colder winter months. 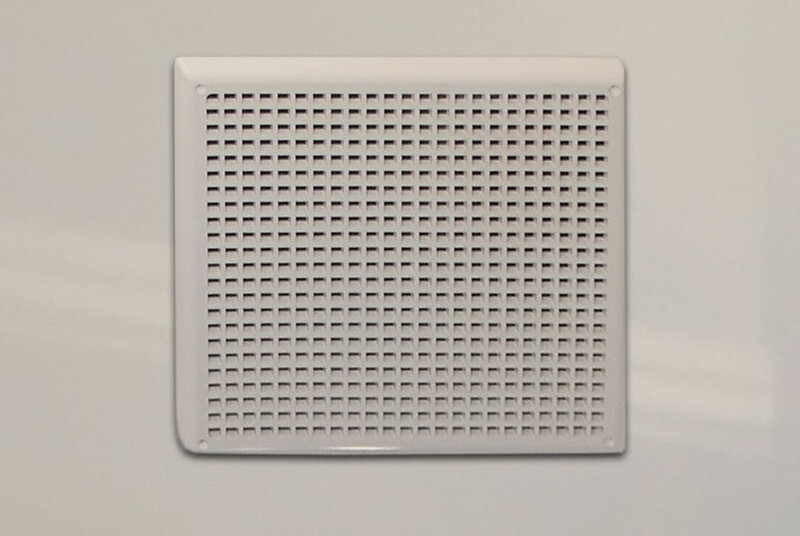 Ceiling vents will offer any additional ventilation inside the restroom whenever you need it. 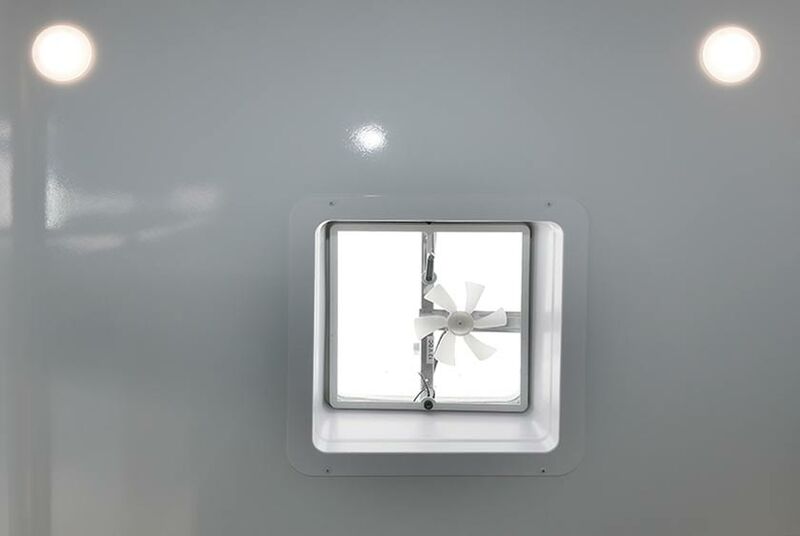 The LED high-hat ceiling lights will supply plenty of light inside the SOAP STONE Restroom Trailer. 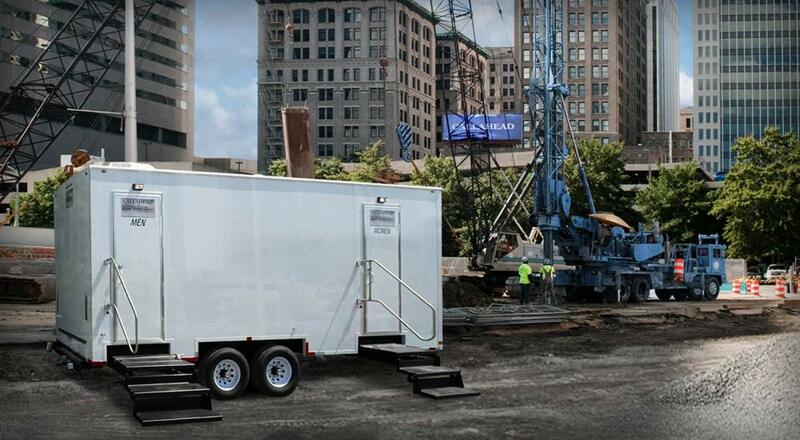 The restroom trailer runs on a 110-Volt outlet or generator for convenience. 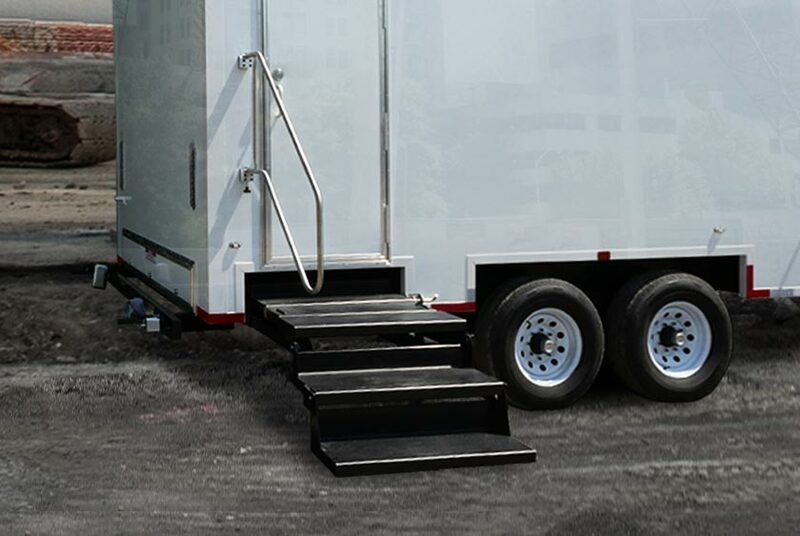 The SOAPSTONE Restroom Trailer is available for delivery throughout New York City's five boroughs of Brooklyn, Queens, Manhattan, Staten Island and the Bronx, and of Westchester, Nassau, and Suffolk Counties. CALLAHEAD also has available our hospital grade cleaning service daily, weekly, monthly, or tailored to your request. 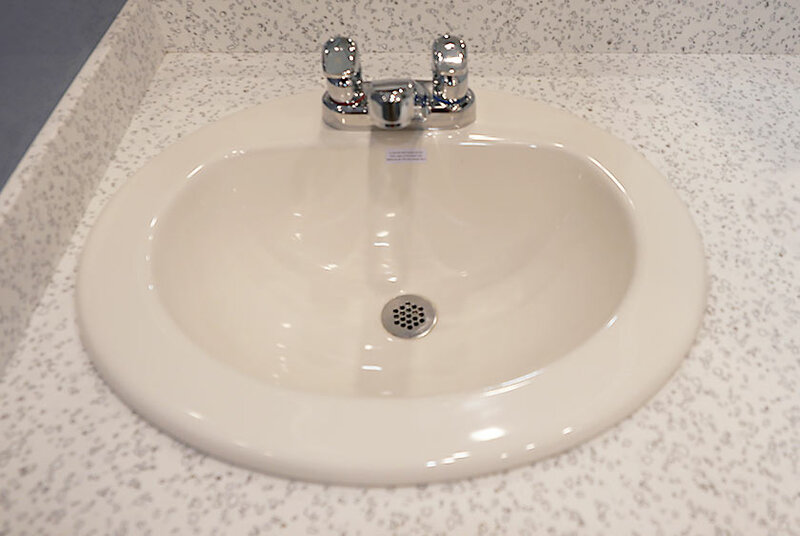 A CALLAHEAD professional uniformed service specialist will clean and sanitize the SOAP STONE with only hospital grade cleaners and disinfectants as well as re-stock it with supplies at every service. 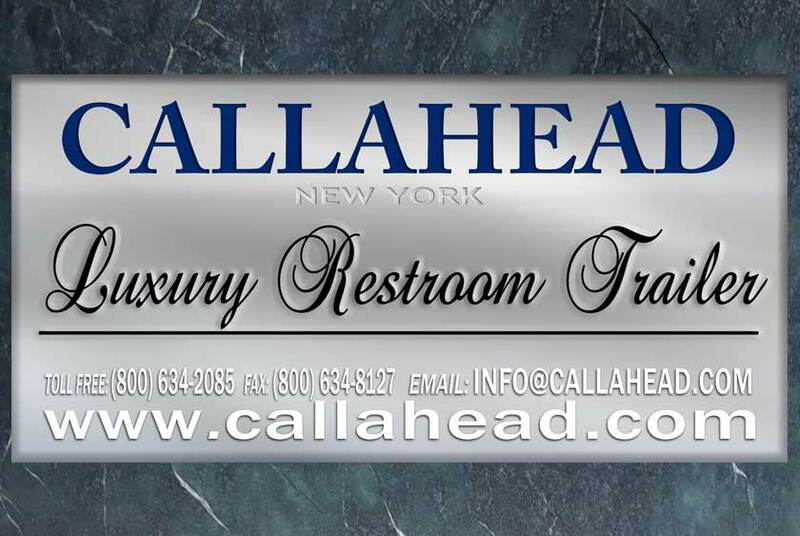 CALLAHEAD is New York's largest portable sanitation company. Since 1976 we have been inventing and designing the world's greatest equipment for our customers. 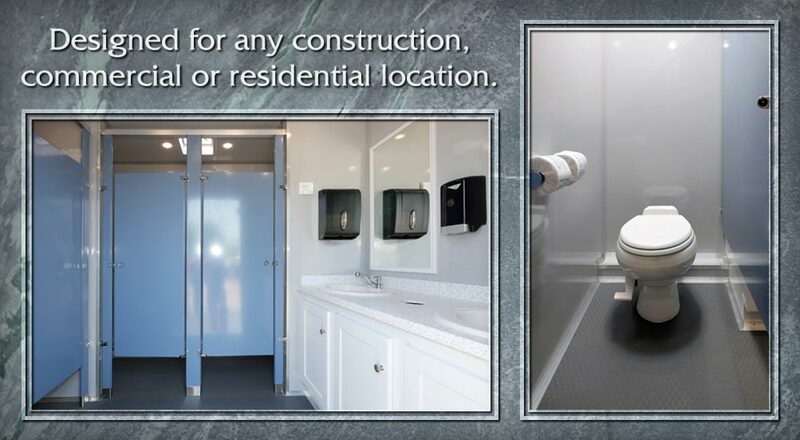 Our dedication, innovation, and unmatched cleaning service have made CALLAHEAD the most trusted portable restroom company for all of your portable sanitation needs. 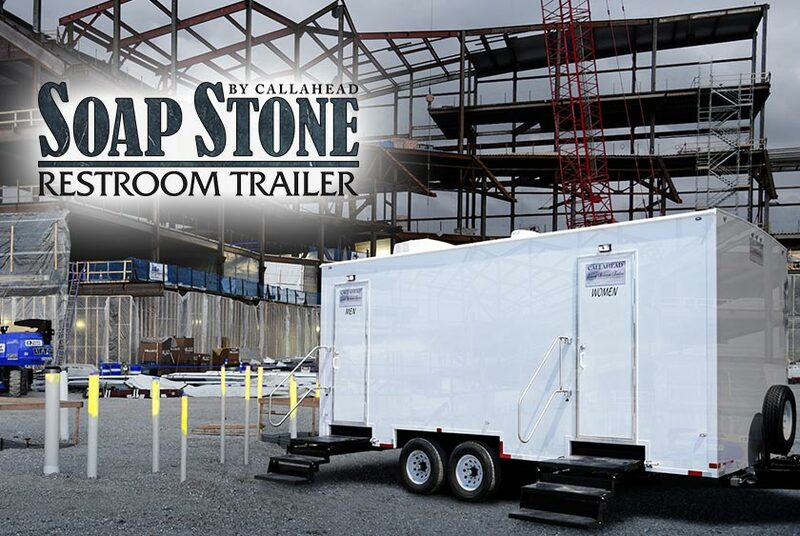 For more information about the SOAP STONE RESTROOM TRAILER or any of CALLAHEAD's state-of-the-art equipment, including high-rise portable toilets, luxury restroom trailers, special event portable toilets, standard porta potties, portable sinks, porcelain toilet systems for office trailers, guard booths, ticket booths, holding tanks, fresh water delivery, commercial portable sinks, antibacterial and hand sanitizing stations, long-term and shortterm portable toilet rentals, long-term and short-term restroom trailer rentals, portable shower rentals, and portable storage shed rentals, please contact one of our expert sales specialists at 800-634-2085 or visit our website for full photos, details and videos of our equipment for all your portable sanitation needs at www.callahead.com. 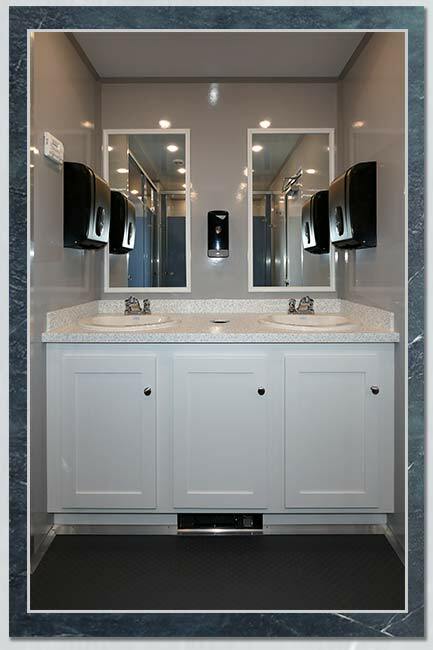 GoJo Hand Cleaning Dispenser can be installed in the SOAP STONE Restroom Trailer and filled with the #1 heavy duty GoJo hand cleaner. GoJo hand cleaner is a favorite among auto mechanics for its ability to quickly break down grease and grime. 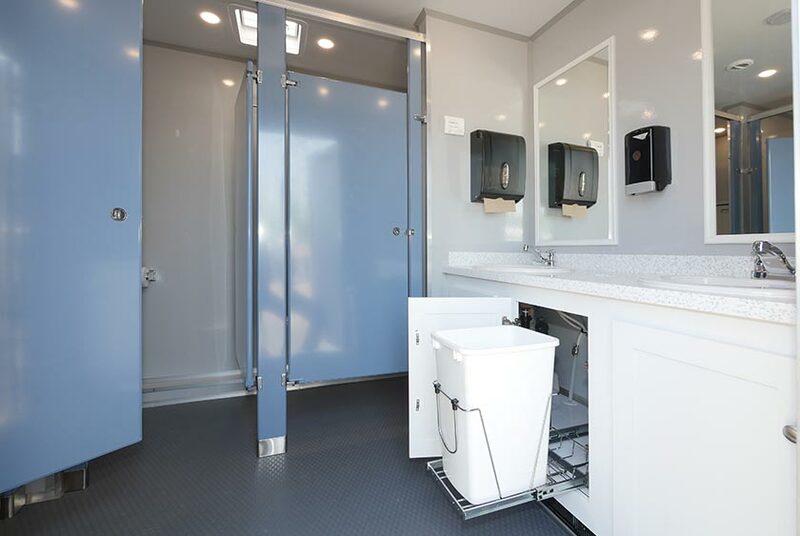 GoJo Hand Cleaner has become popular with construction workers and contractors to remove acids, cement, and other solvents from hands • Antiseptic Dispenser is installed inside your SOAP STONE Restroom Trailer rental, and filled with our waterless hand sanitizer. Our waterless hand sanitizer kills 99.9% of germs and bacteria and meets OSHA and Health Department requirements. The antiseptic dispenser is perfect for sanitary protection before and after using the restroom. 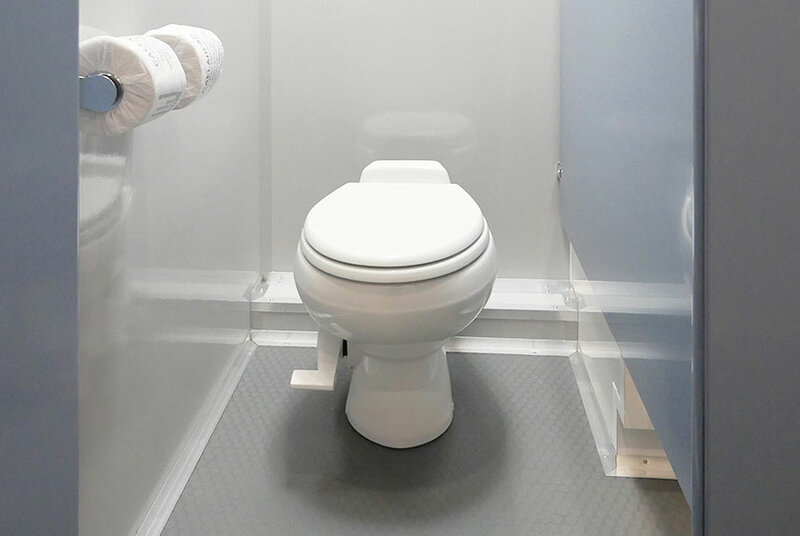 The antiseptic dispenser supplies approximately 900 - 1300 uses • Headliner Toilet Seat Cover Dispenser is installed inside each stall of the SOAP STONE Restroom Trailer, filled with 250 toilet seat covers so every user may have a clean, dry and sanitary toilet seat. • Headmist Time Released Air Freshener is inside the SOAP STONE Restroom Trailer that will release a fresh, clean scent automatically. 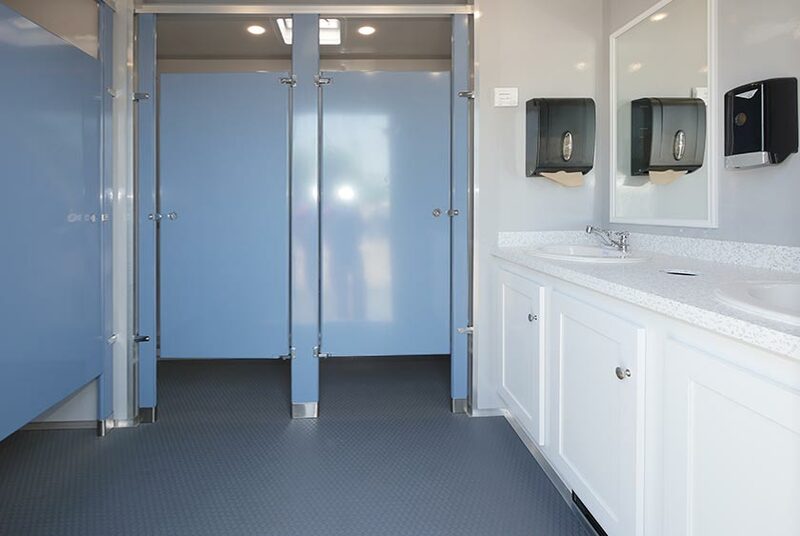 • Professional Uniformed Restroom Attendant is available to maintain cleanliness of the SOAP STONE Restroom Trailer during a special event so you will not have to worry. 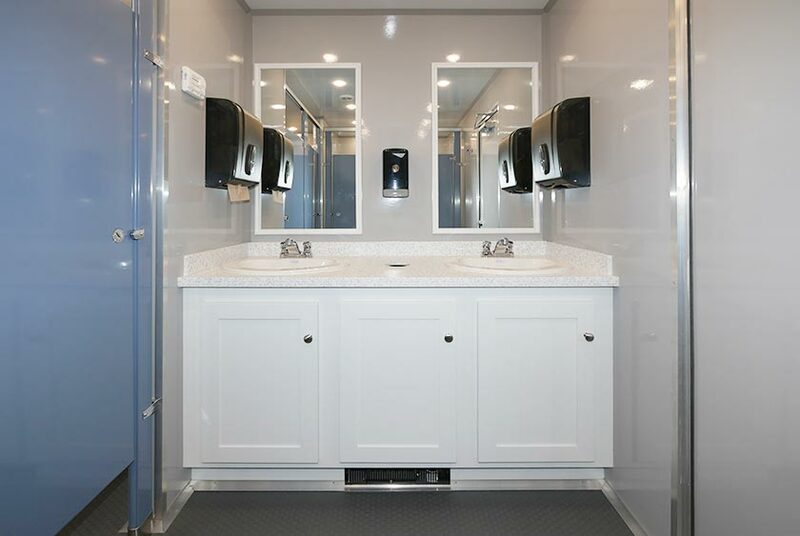 Our trained professional restroom attendant will clean your restroom trailer after each use to ensure every guest is guaranteed a clean visit to the bathroom. 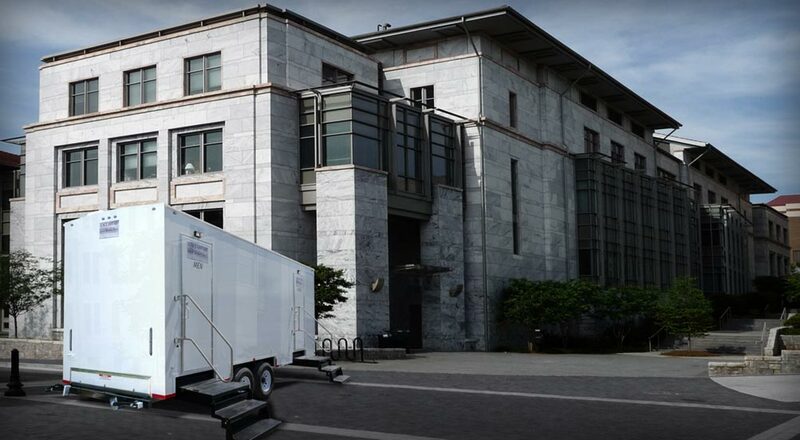 A uniformed restroom attendant is recommended for special events with large crowds; if your event is cocktail, formal or black-tie attire, such as a wedding • Professional Hospital Grade Cleaning Service is available daily, weekly, monthly and everything in-between to clean and sanitize the restroom trailer. Our professional uniformed service technician will service and re-stock all necessary service items and amenities at each service. 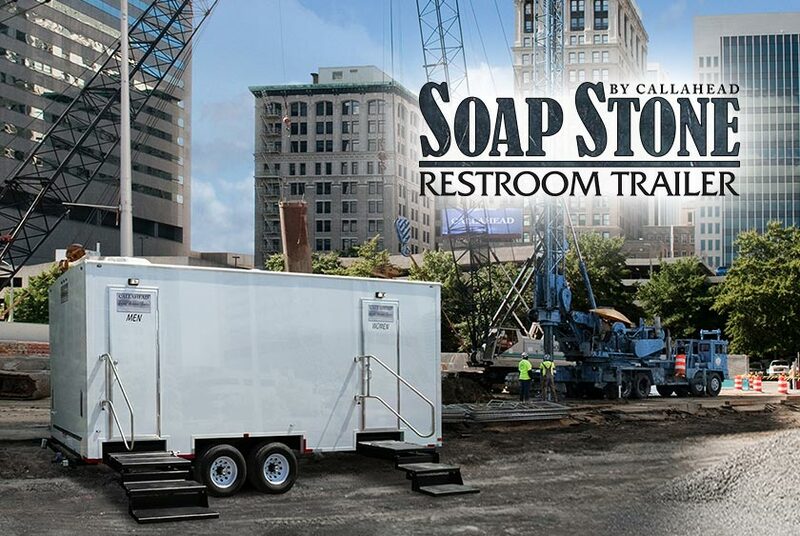 The SOAP STONE is a CALLAHEAD 8-Station portable restroom trailer rental excellent for construction or any long-term need. 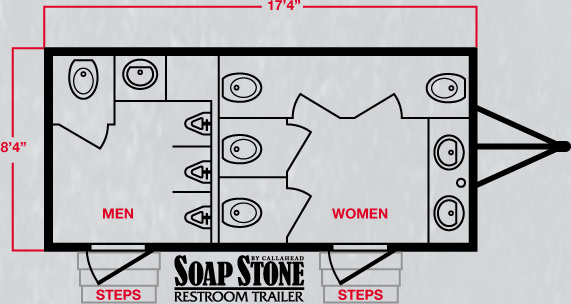 The SOAP STONE Restroom Trailer delivers clean and comfortable separate women's and men's bathroom facilities. Professional delivery of the SOAP STONE includes New York City's five boroughs, and all of Westchester, Nassau and Suffolk Counties. 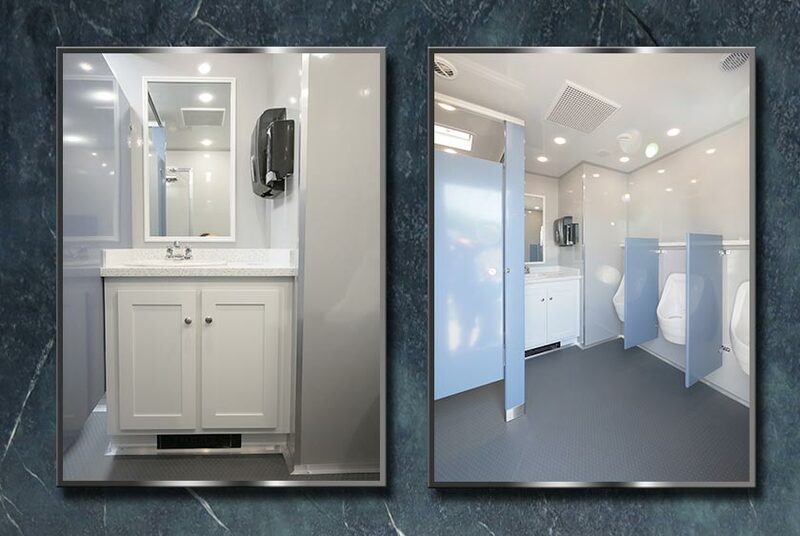 The SOAP STONE is a very spacious restroom trailer equipped with thermostat heat and air conditioning for year-round use. 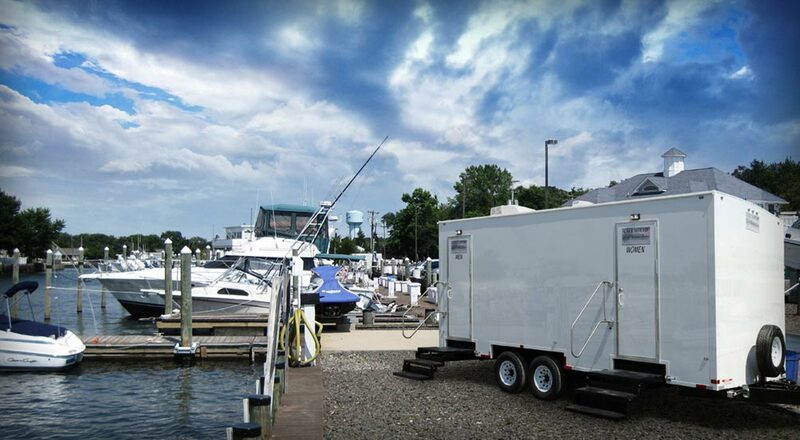 Whether you require a portable restroom trailer for an office building's bathroom renovation, construction site, water shut-off or emergency situation CALLAHEAD will provide all the necessary amenities for a sanitary trip to the restroom. 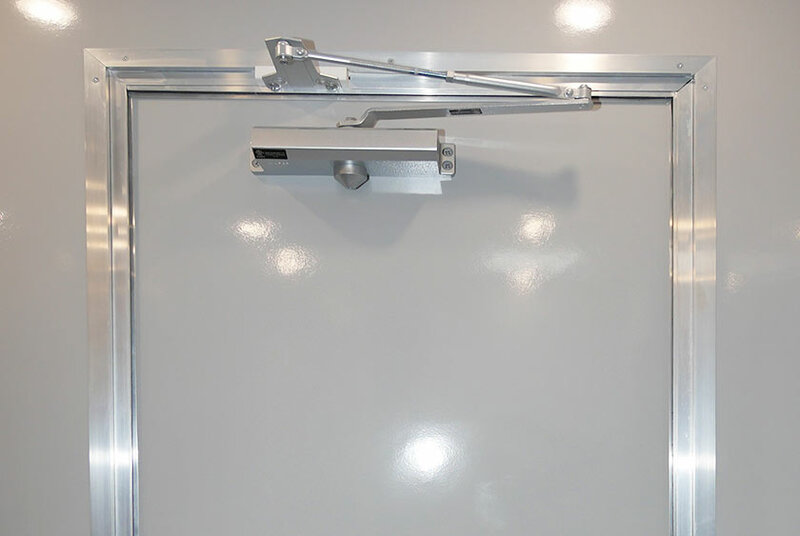 The SOAP STONE is a CALLAHEAD brand that will deliver hospital-grade clean bathroom stalls and hand washing sinks when and where you need them. In business since 1976, CALLAHEAD has decades of experience to ensure you always receive stress-free service. 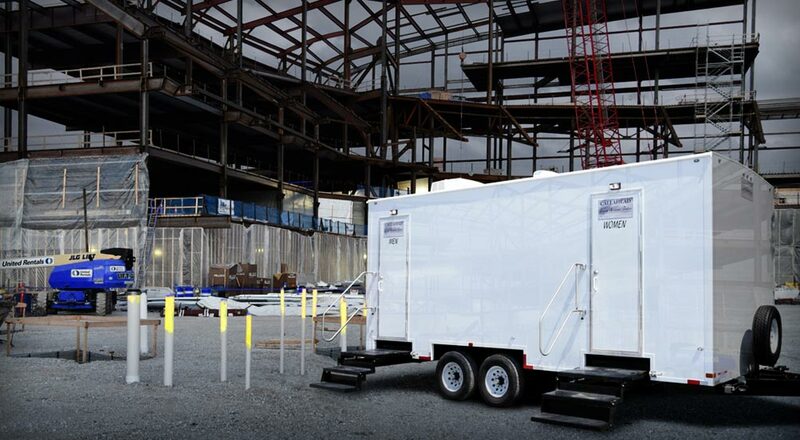 The SOAP STONE Restroom Trailer has a white exterior plus outdoor lighting for evening construction sites. 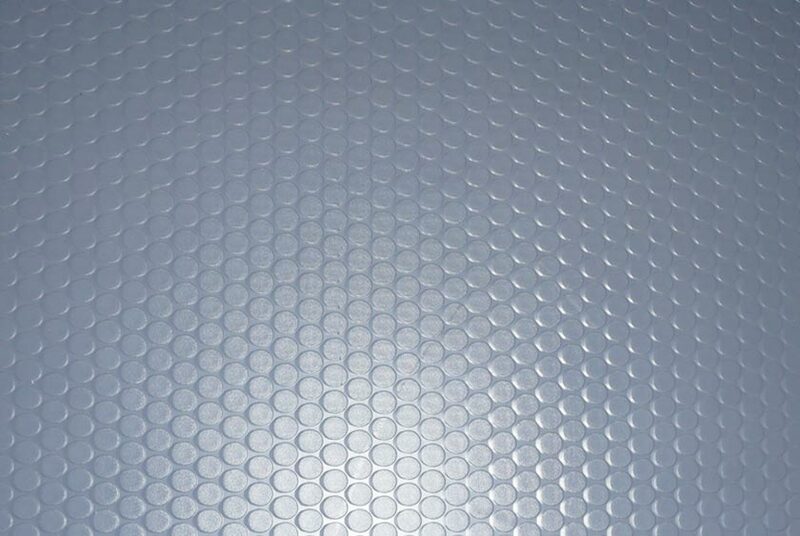 The wide floating entry staircases of both the women's and men's restrooms have slip-resistant services and stainless steel handrails. 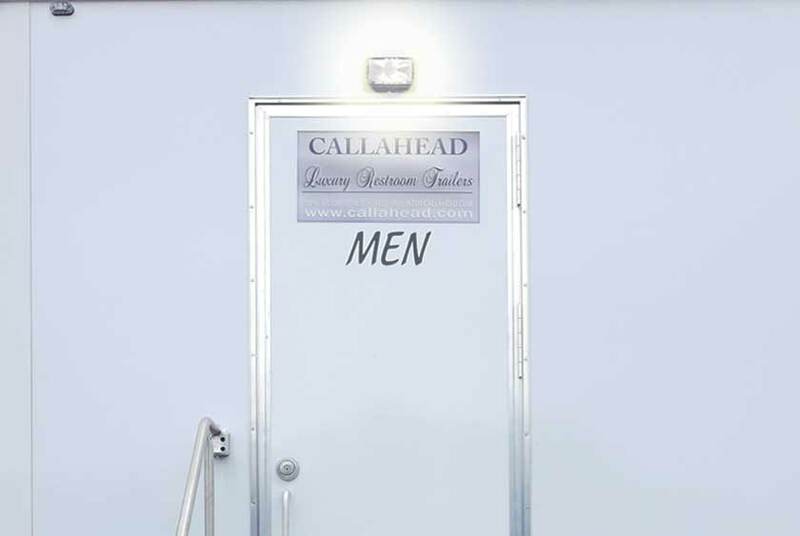 The restroom's entry doors are self-closing and display CALLAHEAD's signature signage.